The PLJV ConocoPhillips grant program has supported habitat conservation for nearly 25 years, investing over $2.2 million into more than 260 projects around the PLJV region, with most of those projects providing habitat through traditional restoration or protection activities. Although ConocoPhillips grants are relatively small, $25,000 or less, they can provide greater value when used strategically within a broader plan. Take a look at Kansas Department of Wildlife, Parks and Tourism (KDWPT), for example. Rob Unruh, manager of the Jamestown Wildlife Area, has applied for three PLJV ConocoPhillips grants to help fund discrete projects within Jamestown — and received funding each time. He has also been successful in leveraging those funds by using it as non-federal match for North American Wetland Conservation Act (NAWCA) grants. KDWPT received a 2014 PLJV ConocoPhillips grant for improvements to Pintail Marsh. The project will enhance a 120-acre cropland field by converting and restoring 58 acres into an emergent marsh by installing earthen berms with water control structures to be managed as a moist soil unit. The project is the southern terminus of a complex of managed wetland and upland habitat, which provides habitat utilized by a diverse population of bird and wildlife species. In 2012, KDWPT received a grant to enhance 237 acres of emergent marsh wetlands at Jamestown Wildlife Area to allow the best foraging habitat for migrating shorebirds, teal, pintails and cranes. Pump stations and pipeline were built to move water from the existing Marsh Creek to create mudflats and shallow water areas at Buffalo Creek. The project built on the previous Buffalo Creek Marsh project, completed with a 2008 PLJV ConocoPhillips grant, which restored 197 acres of emergent marsh wetlands in two pools along Buffalo Creek. Low levees and water control structures helped restore cropland to shallow emergent wetlands. KDWPT has used the three ConocoPhillips grants as match in several NAWCA grant applications. The 2012 ConocoPhillips grant was used as match for a standard NAWCA grant awarded this year, which will fund the construction of enhancements to the Marsh Creek and Gamekeeper Marshes located upstream of this project. 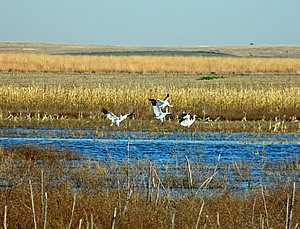 It will also provide funding for additional acquisition at the Jamestown Wildlife Area. The 2014 ConocoPhillips grant will be used as match for an upcoming NAWCA small grant proposal for continued restoration work in Jamestown.